Daisy is a beautiful golden buckskin mare that has several years of professional training. She has been ridden in the arena and on the trails. This mare has been hauled to clinics and shows and group trail rides. 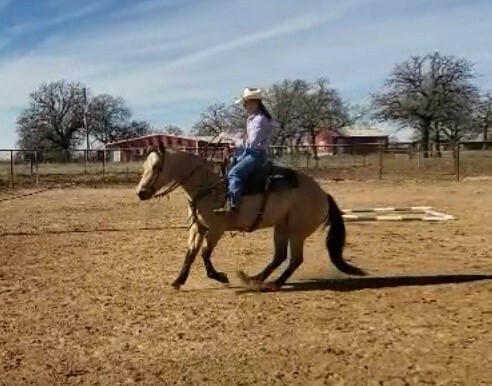 She has training in Ranch horse events and has some experience in showing Ranch Riding, SHOT Pleasure, Ranch Trail and Ranch Reining. She has a nice jog, an extended trot, an easy lope, a controlled extended lope, and a great stop. She has been started on cattle and has a great handle. Easy to spin and do rollbacks. Can do simple or flying lead change. Has done some ranch roping in the trail class, roped a dummy, drags logs. UTD coggins, shots, loads, hauls, shoes.